The Best basketball arcade game… which would that be? 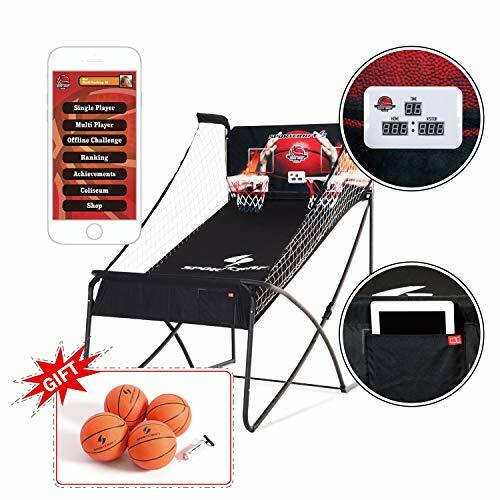 Do you like to play a good electronic basketball game at home? Or do your kids need to burn a bit of that energy during winter time? An indoor basketball arcade game can be a nice solution. Or if you are searching for basketball system comparisons and reviews check out the comparison table below. Here I listed the top 10 best Basketball Arcade Games of 2019. There are both, double hoops and single hoop versions in the list available. Let’s start with a few big basketball arcade game brand names. Below is a summary of the main cons and pros of the selected basketball arcade games. The lifetime 90056 basketball double shot arcade system is an arcade system with an adjustable height. Here is the lifetime double shot arcade basketball system instructions / manual. The electronic scoreboard is not on batteries but on AC power. Assembly instructions are adequate. The goals are sturdy and, even when playing roughly, the unit doesn’t wobble. Some reviews said the electronic scoring was not always working. Others say if you are careful with assembly you should have no issues. 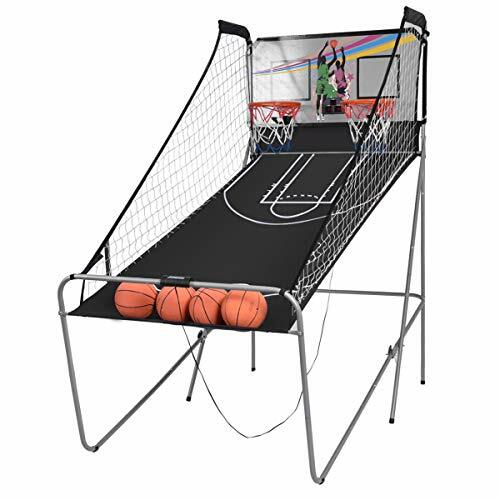 The Sportcraft arcade hoops basketball game is a special one in our opinion. One of the arcade game options is playing against friends in another location through the app. For the Sportcraft double shot electronic basketball arcade game instructions click here. It has a great price/quality ratio compared with other units. Challenging others online adds a lot of fun to the game and there are a lot of different game options. There are a lot of people complaining over the rims, they don’t seem to sturdy. And somehow some people love the customer support and some say it is terrible…? Spalding used to be one of the great brands in the basketball arcade world, it is not any more. It is really hard to find one even on their own site. Perhaps they are skipping this niche or perhaps we are not such good in searching. Alas here is what we did find: the Spalding pro arcade basketball game, single hoop and the Spalding double pop a shot arcade basketball game. If you really prefer a spalding one check out eBay and Walmart too. This machine has loud sound effects which can be annoying. The electronic score board seems to die often within a year. The rim is not sturdy enough to abuse it so only use it according its purpose. Finding replacement parts is not easy. This system has a compact footprint, a nice ball return, solid rim and a decent mini basketballs. The scorekeeper plays music when you make a goal. The holes for bolting the frame together seem misaligned which makes the assembly more of a hassle for some customers. 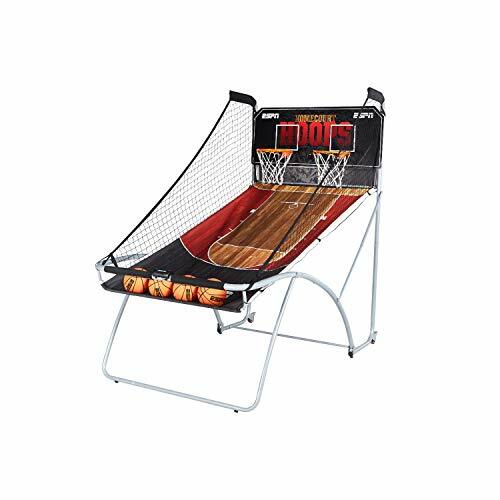 This Giantex arcade basketball game set comes with 4 x 6.7″ mini basketballs and a pump. It has an electronic dual display scoring board with infrared optical sensors to keep score and sound effects. It can be assembled within one to two hours. The score board keeps the count reasonably well. Sometimes misses a score or counts one. You get what you pay for, for this price it is not a bad buy. It has a cheap feel over it. Lately there seem to be a lot of missing parts when arriving Customer support almost unavailable. The net gets stuck on the black score keeper. The Triumph Big Shot II has 8 different games to play, with sound effects and a game clock. Playing games example: Around the World, Horse, Beat the Clock. It comes with 4 mini basketballs. Batteries or plugin ac power. The storage space it takes when not in use is 39.5” L x 49” W x 81” H. Weight is about 48 pounds. The next on this list is the Espn double basketball arcade game. 4 times a 7″ basketball with an air pump is included. 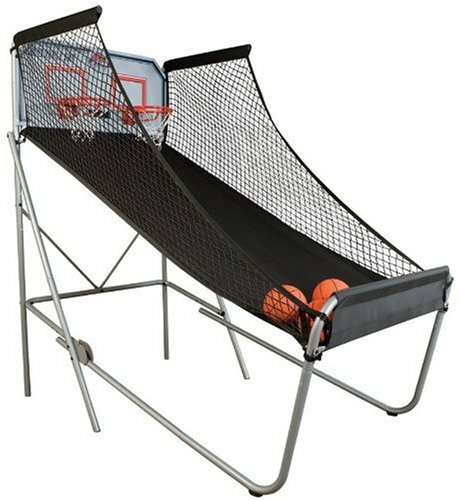 This indoor hoop set folds down to about 48″L x 20″W x 80.5″H making storage and moving simple. It has 8 different games to play alone or together with another player. The electronic LED scoring system is build in. It uses batteries for the sound system and the game clock. Build: It has a sturdy metal frame. Weight is about 51 lbs. It has 12″ steel rims with an 3/8″ MDF blackboard. This set is designed in the United States and the customer service team is also located in the U.S. It is a part of MD Sports. Unfolding the arcade game is easy by a button on the sites, doable alone. The assembly is quick and the whole construction has a solid feel to it. The ball return ends quite low so you have to bend over to pick it up. Not nice for people with a bad back. The problem which seems to arise most is a dead scoreboard after a while. What is THE best basketball arcade game? But what is the best basketball arcade game for your needs? That depends on what you want to do! Do you want a double hoop, or a single hoop. How much space do you have, as even folded up these things need lots of space. Or are you more into a basketball app? No, that is way too lazy… Better be the next Michael Jordan! Others: The Atomic double shootout arcade basketball game or the Carrom free throw duel basketball game. 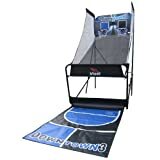 For some of us space is important and the option to store their arcade game as small as possible by just using a fold out basketball game is the best option. 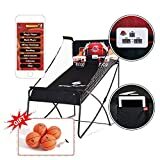 Here are 3 folding electronic basketball games which stood out, mainly because of quality compared to easy of folding it away and space it will take when folded. Further on it is good to notice there are a few not so famous or new brands on the basketball hoop arcade market. Often they don’t have a lot of reviews yet as there are not so much users. Yet. But that doesn’t mean there are no good ones between them. So here are some summaries with reviews. OK this one was on the bestseller list too. The scoring system seems to work well. (at least for the reviewers I found). The assembly is easy. This baseball arcade system has no sound effects. And also no multiple gaming options. It only has a 30 second timer, which IMHO doesn’t make this a nice home baseball arcade game. Quite boring even. The scoreboard of the Carrom 752.69 is accurate. Works on an AC adapter or on batteries. This system is cheaply build so the change that you need replacement part is big. Unfortunately those seem to be unavailable. So I would not recommend this one either. The Atomic Double Shootout Basketball Game is according to the reviews not earning his place in the bestseller list. The quality lacks so if you choose this one, be prepared to repair. The balls get stuck between the return. This one has a higher price tag but definitely doesn’t live up to that. The EastPoint Sports Multi-Player Arcade Basketball Game Set is terrible to assemble. There are pieces missing. The baseball system is smaller then expected but good for kids up to about ten years old. There are not a lot of reviews yet on the Harvard Single Shootout Basketball Game. Harvard customer service is good, which you hope you don’t need but if so it is good to know. The assembly instructions are not to clear but it is easy to put together according to the reviewers. This basketball arcade game has a lower average rating by it’s customers. But the Downtown-3 Indoor Basketball Arcade Game is also on the bestseller list so here is the review summary. 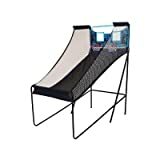 Keeps the fight down between your 2 kids as they can play at the same time. The system folds up OK, but still takes up a good bit of space. The customer service became good lately. According to some reviewers it only lasts for a short while. especially the electronic score board. The assembly is hard and the assembly instructions are bad. Though the reviews of the Sport Squad Double Overtime Basketball Electronic Arcade Game are not so positive, 3 stars out of 5 on average, this Basketball Arcade Game ends high on the bestsellers list so I included it here. Easy to read assembly instructions. Quickly fold-able to create more room. Solid enough if you use it for it’s purpose. Lots of game modes for hours of playing fun. Terrible load of assembly work, but it does seem they rearranged the packaging of all the parts. It seems most of the problems are worked out now. Watch that gentleman on the left…! Simple extra tips to keep in mind while buying a basketball arcade game. Many people, regardless if they are grown up or not, like playing arcade games. 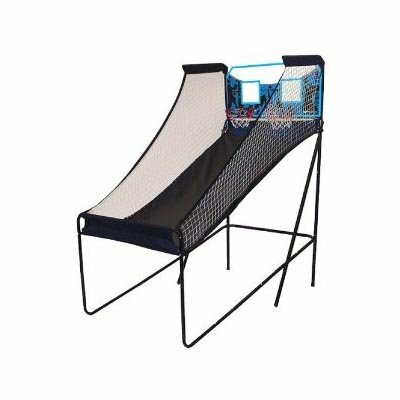 With the number of arcade games that you can find on the market now, you will be challenged to know the type of the basketball arcade game to choose. It is easy to be aware of the type of arcade game if you know why you need the game in the first place and who will be using the game. The ball returns automatically by how the double shot arcade is build. The basketballs can have a normal size or you can have a system where you use mini basketballs. 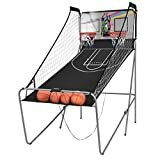 Often a foldable indoor basketball arcade game have those mini basketballs. Know if you are looking for a single or a double hoop. Are you playing mostly alone? Then a single will do. Are you playing together? With a single one you have to wait your turn while with a double hoop the game is way faster. So a double is nice for impatient kids or if you often play in bigger groups (or impatient grown ups). Most people prefer a double hoop shot system as it doesn’t take much more space then a single hoop system. Game options can differ by if you have a single player or a multiplayer indoor basketball hoops machine. 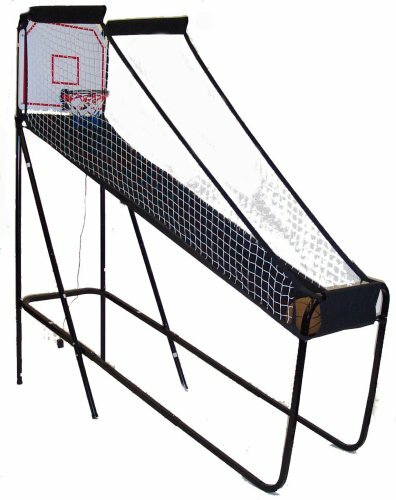 Before choosing a basketball arcade game, take the space where you want to keep it into account, so measure the space you have available. If you are buying a large arcade game, you may need to use a basement or a large space where you can keep the game. There are a lot of basketball arcade systems which fold up nowadays but even then they will take up space. However, you have to keep the game away from where there is too much traffic in order to preserve the game and to ensure that none will get hurt. Amount of money you wish to spent. 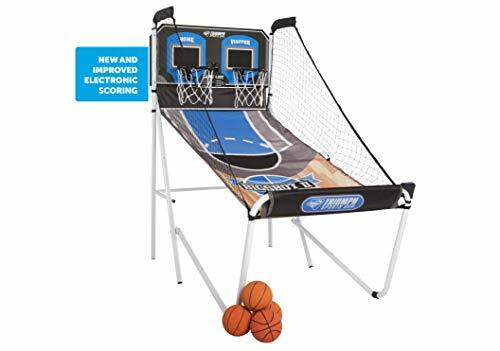 Do you expect to get a real arcade quality electronic basketball hoop? Then you need to expect to pay about $2000 up. These games are more priced between the $130 to $400, so you can get a baseball system way cheaper. But as always, sometimes it is just worth it to fork out a bit more (or a lot in this case) like if you intent to use it for more intensive usage. Like in a youth hostel or a cafe. When buying a basketball arcade game, consider who will mainly play the game. You have to put into the consideration the age of the person you are buying the game for. This is to know the level of the difficulty of the game that you have to buy. The age of the player also will determine his height which can impact on the game you want to buy. The best game to buy if you have a growing family, is to buy a game that is adjustable. Before you start assembling the basketball arcade game, it is important on your part to understand its installation. With this in mind, you will be able to decide if you will need an hour or an entire weekend to assemble the game or if you will need an extra help. You also need to keep in mind if you will need the power to run the game. Some games require the effort of the player while others may have to run on an extra source of power. Those indoor basketball hoops have a scoring system that often works with a led scoreboard or an electric scoreboard to check up on the game set. If the game includes sounds or lights, it may require running on the AC or battery power. Be aware of the accessories you need for your basketball arcade game. The equipment that comes with the game may not be enough to let you play for a long time. For example you may need to have extra balls in case you lose the balls you were playing with. You may learn about the accessories you need for the basketball arcade game from its manual.